Introduction. 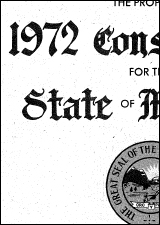 This website collects material relevant to how the proposed Montana Constitution was represented to the voters during the ratification campaign of 1972. The files are in PDF form, and many are word-searchable. Reason for Collecting the Material. When re-creating the original force of a constitution, interpreters consider the intent of the drafters ("original intent"), the understanding of the ratifiers ("original understanding") and the objective public meaning of the document to a reasonable person at the time of ratification ("original public meaning"). When available, the original understanding is the most important of these, for it represents the views of the ratifiers who converted the instrument into law. When no unified understanding is recoverable - either because of conflicting evidence or (as in the case the Montana Constitution) because the ratifiers were thousands of voters - then the governing standard is the original public meaning. The intent of the drafters of a constitution is important primarily to the extent that it sheds light on the original understanding or original public meaning. Previously, Montanans had ready access only to materials probative of the original intent, the least important of the three standards. For reconstructing this intent, the constitutional convention transcripts are useful. They are availablehere. This website provides information tending to prove original public meaning or, perhaps in a few cases, original understanding. Kinds of Documents Collected. The collection includes a range of materials tending to show how voters would have understood the Constitution before going into the voting booth. We particularly sought out documents representing the Constitution to the electorate before the vote, although there are other kinds of documents, also. Time Frame. Most of the documents are from the period of the ratification campaign. This ran from March 22, 1972 (when the convention adjourned) until June 6, 1972 (when the voters went to the polls). However, there is one file that collects newspaper articles covering the convention itself, because those articles helped to inform the voters' understanding of the document. There is also an election post-mortem. How the Material is Organized. The documents are arranged in "collections." The collections are identified by the sources from which they were culled. They do not necessarily reflect other logical categories. Most of these sources have additional documents pertaining to the Constitution. For this website, we selected documents that were (1) relevant to the ratification campaign and (2) did not duplicate documents otherwise posted here. There are seven discrete collections of materials on this website, each one reflecting the person or institution making the material available. This is a single large file made from pages provided by former Secretary of State and Senate President Bob Brown. It collects newspaper clippings reporting on the Constitutional Convention while it was in session. Dates on this material are not always available. The file has been treated to make it word-searchable, but the quality of old newsprint varies, so it cannot be guaranteed that every use of a particular word will be identified in a search. This collection contains material donated by convention delegate Bob Campbell. It includes a very important summary of the Constitution by Prof. Richard Roeder (a leading advocate), which was inserted into many Montana newspapers. It also includes a pamphlet by Billings attorney Gerald Neely (who was a UPI stringer during the convention), and material opposing ratification produced by a group called Citizens for Constitutional Government. The word-searchability of this material varies. This includes material from the Montana Historical Society's offices in Helena. It features a wide range of pamphlets, correspondence, articles and speeches. Unfortunately, due to our own photography, the quality of some of the reproductions is marginal. Most of this material is not word-searchable, although some items are. Those items are marked "ocr" (optical character recognition). This collection includes all articles that we could locate in five major newspapers on the Constitution appearing from March 22 - June 6, 1972. The newspapers are the Billings Gazette, the Great Falls Tribune, the Helena Independent-Record, the Missoulian, and the Montana Standard (Butte). They were reproduced from microfilm located at the Mansfield Library at The University of Montana. Because the quality of the microfilm varies widely, so does the quality of the PDF files into which they were converted. Files that we managed to render at least partly word-searchable have the letters "ocr" (optical character recognition) in the file name. The exact dates of particular articles are not always recoverable. The file name "Great Falls Tribune 0372 ocr" means that the file covers the Great Falls Tribune for March, 1972, and is, at least in part, word-searchable. A file name "Billings Gazette 0515-2372" means that the file covers the Billings Gazette for May 15-23, 1972, and is not word-searchable. This material was made available by retired Billings attorney Gerald Neely, the author of a pamphlet on the Constitution available in the Campbell Collection. It contains (1) the two issues of a newsletter edited by Mr. Neely during the constitutional convention that are most relevant to the meaning of the Constitution, (2) the Gallatin Voice, a pamphlet discussing the Constitution, (3) a PDF file containing articles on the Constitution published in smaller papers, not represented in the "MT Newspapers Mansfield" Collection, and (4) an issue of the Montana Public Affairs Report containing an analysis of the election by Professor Thomas Payne and Ms. Elizabeth Eastman. These documents are generally word-searchable. This material was provided by the library archives at Montana State University. It is called the Roeder collection, because it is all from the donated papers of Richard Roeder, an MSU professor who served as a convention delegate and leading advocate for the Constitution during the ratification campaign. This Collection includes speeches, correspondence, and published articles. It also includes Professor Roeder's critical, and sometimes angry, annotations of the Neely pamphlet. (Neely was a former student of Roeder's, but their views were on different parts of the political spectrum.) This material is generally word-searchable. In this collection are the official Voter Information Pamphlet, the 1884 constitution (never ratified), the 1889 Constitution, the 1972 Constitution, and an election post-mortem by Professor Ellis Waldron. These documents are generally word-searchable. * For providing collections: Bob Campbell, Missoula; Gerry Neely, Billings; Bob Brown, Missoula; and the staffs at the Montana Historical Society (Helena) and of the libraries at UM-Missoula and MSU-Bozeman. * For research assistance: Sara F. Tappen, School of Law ‘08.